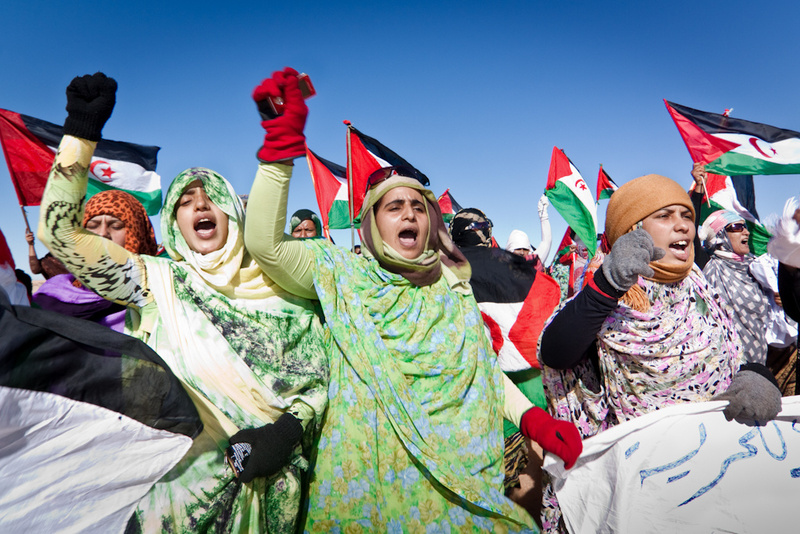 The Moroccan occupation of Western Sahara remains the last case of decolonization in Africa. The Moroccan military invaded the territory on the 31st of October 1975 despite a clear ruling issued by the International Court of Justice a few days before, on the 16th of October of the same year . On the 6th of November 1975, Morocco organized what it called a “Green March” to officially invade the North of Western Sahara moving 350,000 Moroccan settlers to the territory, in complicity with Spain, the colonial power in the territory since 1884. The United Nations Security Council immediately called on Morocco to withdraw from the territory , but the Moroccan King was strongly backed by France and other Western powers. It was obvious that Morocco was violating not only the UN Charter’s principles, such as abstention from “the threat or use of force against the territorial integrity or political independence of any state” , but also the African Union Constitutive Act’s sacred principle of “respect of borders existing on achievement of independence” . This is why both organizations adopted the same position: the rejection of the Moroccan colonial fait accompli, and the insistence on the need to decolonize Western Sahara through a genuine process of self-determination under the auspices of the UN and AU. Other proposals, such as the Moroccan “wide autonomy” is simply an attempt to normalize the illegal occupation. The UN never recognized Moroccan sovereignty of any sort over the territory of Western Sahara, and identified Morocco as an occupying force in 2 General Assembly’s resolutions . According to international law an occupying power cannot exercise control over the occupied territory . In fact, the occupying power doesn’t have the right to change the demographic, economic or political status of the occupied territory, and must respect the rules and principles of international law in its treatment of the people of the occupied land according to the Geneva Convention and to Chapter 11 of the UN Charter among other instruments. In fact, it should not hinder the people’s right to self-determination and freedom. The African Union (formerly known as the Organisation of African Unity [OAU]) went even further. The OAU formally recognized the Saharawi Arab Democratic Republic in 1982 as the legitimate authority in Western Sahara after having paid huge efforts to convince the Moroccan King Hassan II to end this act of aggression against its neighbors. The African Union seeks to bring the two member States, Morocco and the Saharawi Republic, to negotiate under the auspices of the UN without preconditions so as to reach a solution that would end this conflict . Further, the way of consulting the people of Western Sahara, as prescribed by UN General Assembly’s resolutions 1514 and 1541 and confirmed in more than 100 UN resolutions, can only be attained through a genuine and free vote in a referendum on self-determination supervised by the UN and the AU, in which the people have various choices including independence, free association with another entity or integration into an existing entity. Therefore, any consultation that doesn’t include independence will be in total contravention of international law . The solution to the conflict must also be “realistic” according to various UN resolutions. But again, we should read the facts on the ground properly, and ask the right questions: Does Morocco really control the territory? Can it legalize its illegal occupation? Are the proposals of Morocco realistic? If so, why did it not succeed in convincing the Saharawis? A “realistic” solution can only be a solution that guarantees a lasting peace in the territory. Any solution that is not accepted or satisfying to the Saharawi people will never help in resolving the problem. What is real on the ground is that Morocco is still an occupying power. It could not normalize its occupation and is still facing huge challenges in the daily administration of the territory. Morocco is deploying thousands of armed forces and police corps to control the territory committing all sort of human rights abuses and violating all norms of the International Humanitarian law. It is challenged by the Polisario Front with regards to the illegal exploitation of the natural resources of the territory. The two landmark rulings of the European Union Court of Justice of 2016 and 2018 are the latest example of the Polisario’s successful challenges.